During the Nara Period (710-794), a form of popular entertainment named sangaku was imported to Japan from China. This led to the development of sarugaku which included pantomime, acrobatics and magic; and gagaku, a more solemn form of music and dance. While gagaku was being performed for the noblemen and the imperial court at festivals and ceremonies, sangaku (or sarugaku as it became) was spreading throughout Japan being performed at shrines and on the roadsides. noh and dengaku noh. Sarugaku noh was largely based on mimetic movements while dengaku noh was more associated with symbolic movement. And while dengaku noh was accepted by the nobility and performed largely in the capital, sarugaku noh was not accepted in the capital and played largely in Omi, Tanba, Ise and the areas surrounding the capital gaining popularity. At that time both sarugaku and dengaku had formed groups known as the Sarugaku-za and the Dengaku-za. Each group had a leader who acted as the chief support for the performances. In Yamato there were four particularly strong groups: Yusaki-za, Sakado-za, Tobi-za and Enmai-za. These four groups became the four oldest noh schools that remain today the Kanze, Kongō, Hōsho and Komparu schools respectively. The founder of the Yuzaki-za, Kanami, adapted a form of storytelling dance from sarugaku called, kusemai. He was the first to introduce this kind of dance into noh. Kanami also created to famous noh Sotoba Komachi and Jinen Koji. Kanami’s son, Zeami inherited noh from his father and perfected it. In the Muromachi Period, with the support of the shōguns’ Ashikaga Yosimitsu and Nijo Motoe, Zeami was able to develop his own art, borrowing the techniques of his rivals. It was during this time that Zeami developed his notion of Yugen or “mysterious beauty” which he included in a number of his mugen noh (phantasmal noh) including the masterpiece Izutsu which is one of over 50 noh that are attributed to Zeami’s hand. Even now the same poetry and prose that he wrote are still being performed. Following the death of Zeami, his nephew, Onami and the son in law of Komparu Zenchiku, took over as head of the troupe and continued developing the art even as the Onin Wars destroyed the capital. As all this was happening, noh still played a very active role in the lives of the military commanders. Among them, Toyotomi Hideyoshi one of the great unifiers of Japan, took a great interest in noh and studied with a Komparu Tayū and commissioned noh with themes about himself to be created. Noh continued under the protection and patronage of the Tokugawa Shōgunate. The second Shōgun Tokugawa Hidetada made it a law that noh and kyōgen would be the official art forms of the shōgunate and that the four sarugaku troupes from Yamato and the newly formed Kita troupe would be recognized as the official licensed performance troupes. 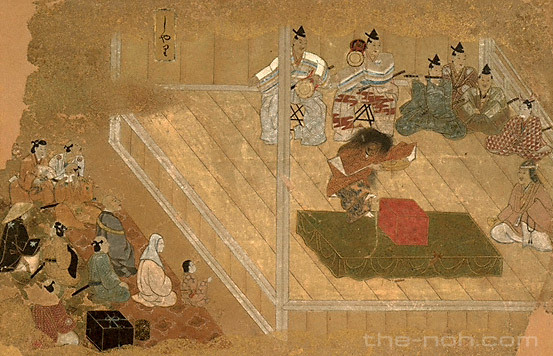 From this, noh’s standing in society was fixed and it continued to grow in popularity with both the elite and the commoners. To this day, it continues to refine itself, however the creative genius from the artists of the middle ages has been lost. Following the fall of the Tokugawa Shōgunate, noh too was in crisis. The following Meiji Period (1868-1912) saw the birth of a new government and industrial system in Japan as well as a return of entertainment for ordinary citizens. Noh too went through a kind of transformation with the development of the iemoto system, the merging of noh and kyōgen into nohgaku, and the building of indoor noh stages. Recently, with the development of people practicing utai (vocal) and shimai (short dance) noh is poised to spread.